It’s been a busy and yet lazy month. I am highly influenced by the weather and my moods often reflect it directly. Sunny outside? I’m off doing something, anything, preferably outdoor. Tending the garden, going for walks and the likes. Gloomy rainy weather? I’m lounging on the couch, Netflix binging. So with the weather this April going from spring to almost winter in a couple of days, I have not been very productive on this blog, sadly. That does not mean I have not been cooking or creating, because oh yes, there are recipes coming! It’s just been a bit harder finding the motivation to work online after work hours. So this recipe is something that has been in my archives and it’s ridiculous it’s taken me months to finally publish. 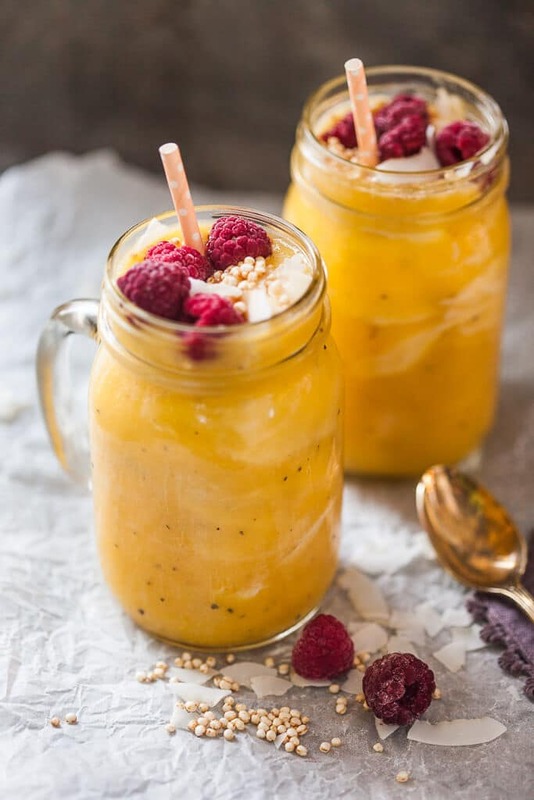 Because this Sugar-Free Pineapple Mango Smoothie is simply delicious. Light, creamy and so yellow. Pure spring yellow bliss, like the sunshine outside today. 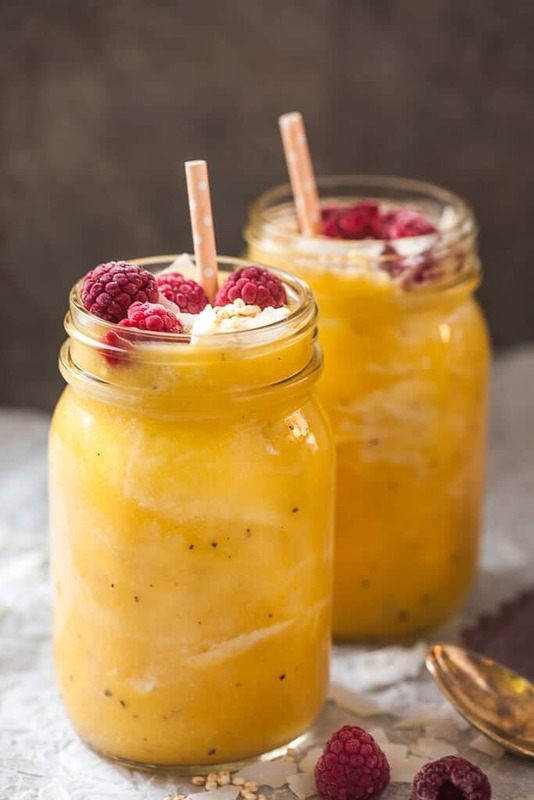 To make this recipe just combine yellow ingredients in the blender and blend until smooth… I used pineapple, mango, banana, orange and a passion fruit, because, why not 🙂 A cup of tropical heaven right there, people. 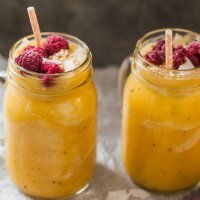 This lovely Pineapple Mango Smoothie is delicious, creamy & sugar-free. Perfect breakfast! Peel and slice pineapple, mango and banana. Add to blender. Cut passion fruit in half and scoop out the juice and seeds. Cut orange in half and squeeze out juice. Add to blender. Add greek yogurt and 1 cup water to blender and blend on high for a couple of seconds, until the ingredients blend into a smooth mixture. Add more water if the mix is too thick. 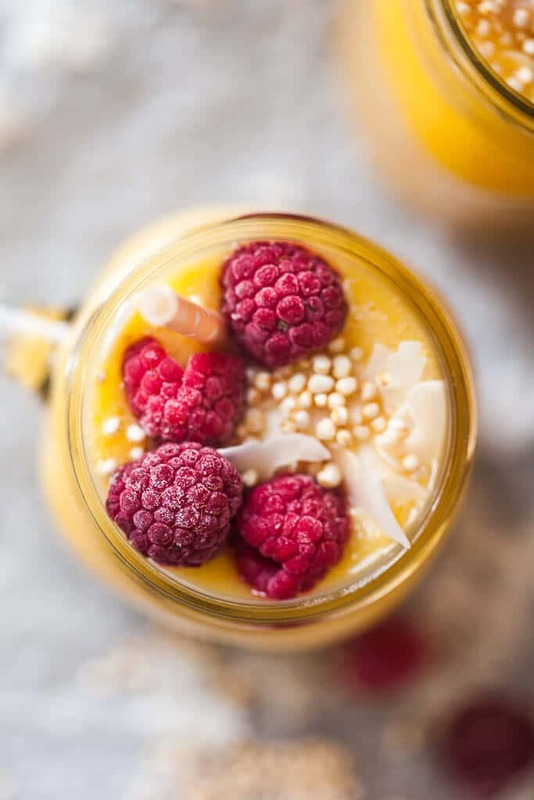 Pour smoothie into glasses and top with toasted coconut flakes and quinoa puffs (optional) and a couple of raspberries (fresh or frozen). Serve. I’m going to make this tasty smoothie sometime in the coming week and I cannot wait to try it! Looks so delicious! It is delicious 🙂 Let us know how you’ll like it if you do try it out.